1. Lots of residue. White and black residue. perhaps oxide? 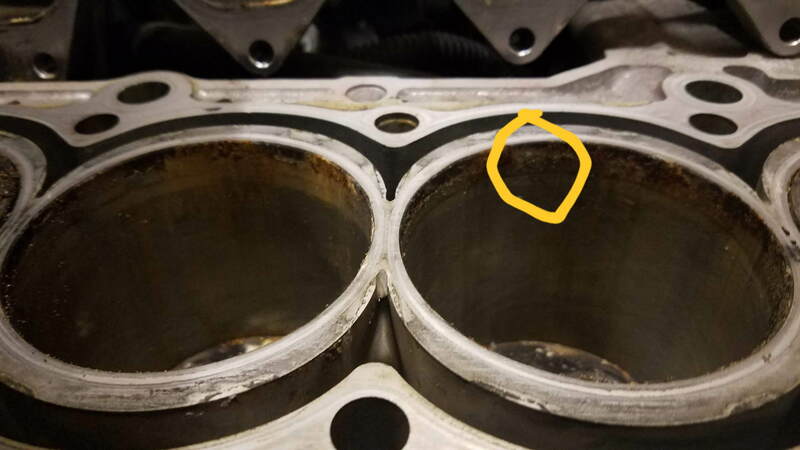 There is also corrosion on the cylinder walls and I am not sure the best way to clean it. Brass brush? 2. 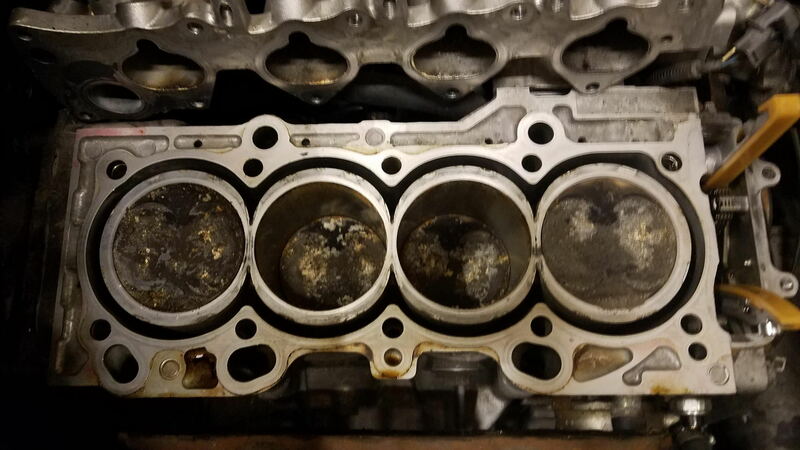 Is it normal for the piston to come out above the block? See below. 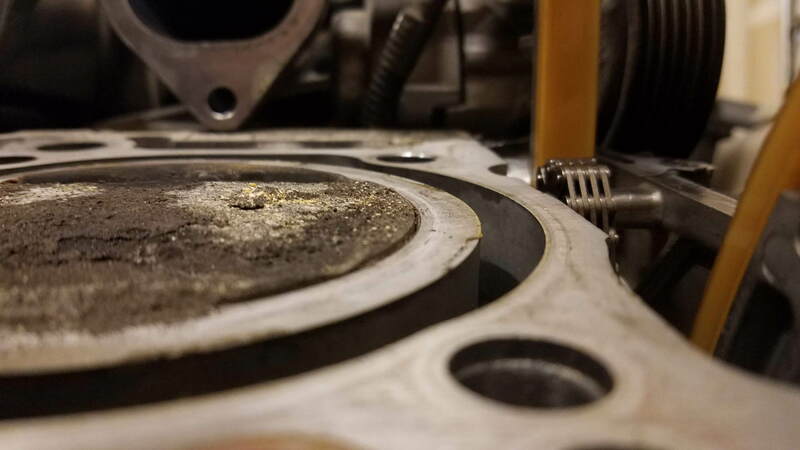 The owner also said that the pistons were bored 2 sizes up (not sure where these sizes are defined), and that maybe another type of Honda piston was put in. One other question; when I removed the cams, I did not loosen the valve adjustment screws or set the engine to TDC (I know this is my bad), and they kind of bound up under the pressure of the valve springs. They came out with a little push but those valve springs are strong and I am wondering if I could have caused other issues. corrosion. Not sure the best way to clean it. You will need to buy a used motor. These engines can't really be rebuilt, and especially not by some random shop. If you do research here on rebuilding engine, you will discover how true this is. Sorry to bring the bad news. And can only re-bore once. Just because a shop besides inlinepro built it does not mean its garbage. Have the head decked flat. Check the block surface to see if its warped and needs to be decked. Put a new head gasket on it and run it. the build up around the top of the cylinder is normal. Just decking the head and a new oem head gasket is ~$150. Last edited by Charper732; 08-18-2018 at 06:11 AM. Don't see a wet or dry sleeved with 75k miles ? Guys, thanks for the responses. Another thing I just noticed. I put each piston on its downstroke and manually pushed down on each piston to check for play in the bearings. Three of the pistons were fine, but one made a little tiny 'click'. The movement was so small that I could not really see it, but I know it moves because of the click. Since the block is suspect anyway, I might just polish the crank, get new bearings, deck the head, and see how long I can run it for. BTW, how much is it to do the inline pro rebuild? I am guessing the cost will be shipping + sleeves + the actual machining. Quick Reply: Bought an engine rebuilt by a random shop, and then. . .